This year, Protestants will commemorate the 500th anniversary of the beginning of the Reformation. 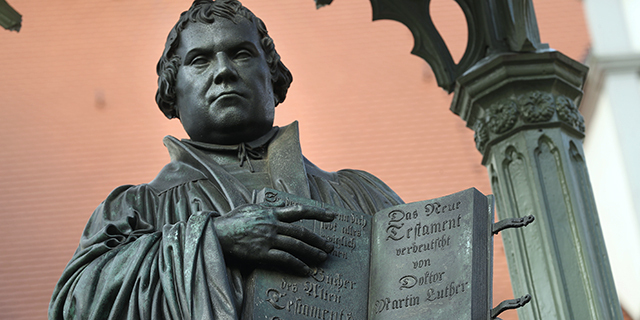 While the exact date of the anniversary is debated, it’s conventionally commemorated on Oct. 31, when Martin Luther publicly posted his criticisms of the Roman Catholic Church in Wittenberg, Germany, precipitating an eventual schism with Rome throughout much of Northern and Central Europe. 1 Globally, Protestants made up 37% of Christians in 2010. That’s a smaller share than Catholics, who comprised 50% of Christians around the world, but substantially larger than the percentage of Orthodox Christians, who represented 12%. While the Protestant Reformation began in Germany, in 2o10, nearly nine-in-ten (87%) of the world’s Protestants lived outside of Europe, particularly in countries that make up the “global south,” that is, developing nations mostly in the Southern Hemisphere. In fact, there were more Protestants living in Nigeria that year than in Germany. The largest share of Protestants around the world (roughly 20%) lived in the U.S., which was, during the colonial era, largely settled by Puritans and other Protestants from Europe. 2The share of Protestants among U.S. adults is in decline, falling from 51% in 2007 to 47% in 2014. The decline is most pronounced among people who identify with mainline Protestant denominations, such as the United Methodist Church and the Evangelical Lutheran Church of America. The share of mainline Protestants fell from 18% in 2007 to 15% of U.S. adults in 2014. By comparison, declines among evangelical Protestants have been more modest (26% in 2007 to 25% in 2014). This downward trend is part of a broader decline in the share of Christians in the U.S., from 78% of adults in 2007 to 71% in 2014. Net losses for Christians have meant net gains for religiously unaffiliated adults, who in 2014 accounted for 23% of the adult population, up from 16% in 2007. 3 In Latin America, where nearly 40% of the world’s Catholics live, Protestant populations have risen sharply. 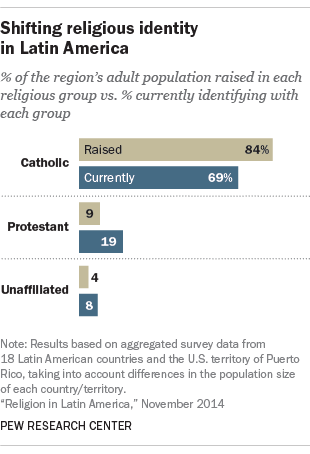 In a survey conducted in the region in 2014, 9% of respondents across 19 Latin American countries said they were raised as Protestants, while 19% identified Protestant (or evangelical) Christianity as their current religion. 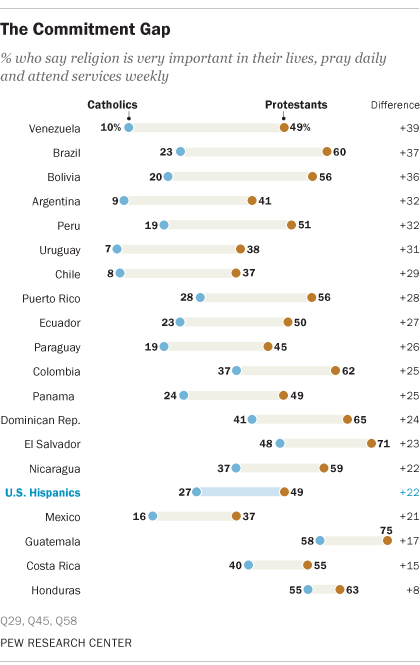 Net gains for Protestants in Latin America have meant net losses for Catholics. While 84% of respondents were raised as Catholic, only 69% identified their current religion as Catholic. 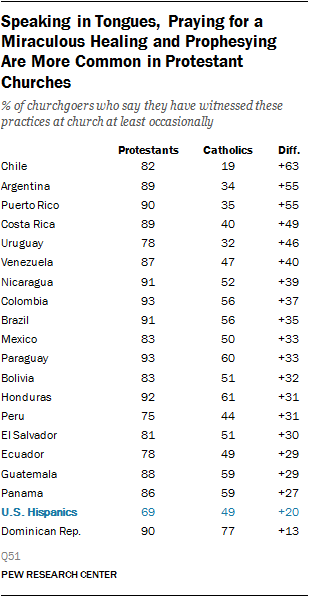 Protestants across Latin America also are significantly more religious than Catholics. And they are more likely to take conservative positions on issues such as divorce, abortion, gay marriage and gender norms. 4One relatively recent and distinctive Protestant movement that has gained ground globally is Pentecostalism. While practices vary, Pentecostal churches often emphasize the “gifts of the Holy Spirit,” such as divine healing, speaking in tongues and receiving direct revelations from God. These practices are common among Protestants in sub-Saharan Africa, Latin America and even in Asia. For example, in a survey conducted in 2014, the majority of churchgoing Protestants across 19 Latin American countries said they have at least occasionally witnessed speaking in tongues, prophesying and praying for a miraculous healing in church. 5 In Western Europe, the home of the Protestant Reformation, Protestants and Catholics are now religiously more similar than they are different, at least on some theological questions. Roughly 370 years after the Thirty Years’ War ended in 1648 — capping more than a century of religious conflict across Europe — many of the theological controversies of the Protestant Reformation no longer divide rank-and-file Catholics and Protestants, according to a 2017 survey conducted in 15 countries in the region. For example, the prevailing view among both Protestants and Catholics today is that faith and good works are necessary to get into heaven – the traditional Catholic position. Fewer people say faith alone leads to salvation (in Latin, sola fide), the position Martin Luther made a central rallying cry of 16th-century Protestant reforms. While Protestants who attend religious services are more likely to identify with the traditional sola fide position, in nearly every country in the region, the share of Protestants who attend church weekly is in the single digits. 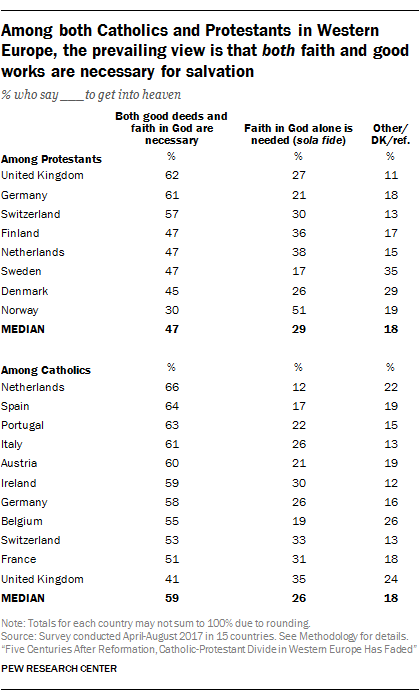 For example, in Germany, the epicenter of the Reformation, just 7% of Protestants say they attend church weekly. Among European Catholics as well, Mass attendance is relatively infrequent. Note: Since this blog post was published, Pew Research Center improved the survey weights for greater accuracy. Subsequent analyses based on data from 15 European countries use updated weights leading to slight differences in some numbers between this blog post and other publications. The substantive findings of this blog post are not affected by the revised weights. Please contact the Center for questions regarding weighting adjustments.